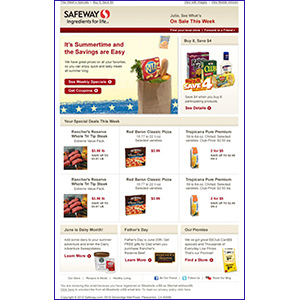 Safeway.com communicates with card club members through several separately branded email newsletters. We were hired to make strategic and tactical recommendations and to produce creative and analysis of segmentation for several of the newsletters. The marketing challenge is for each newsletter to reflect the corporate brand plus be differentiated from one another while producing optimum open rates and club card usage. We provided recommendations, new creative, email testing strategies, email database hygiene and analysis of email testing for several of the newsletters. Results included significant lifts in response rate from personalized emails to lifestyle segments and improved email creative for several newsletter programs.